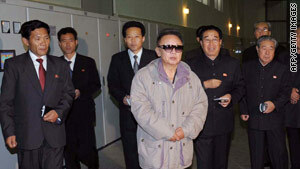 Image released by official Korean Central News Agency Oct. 30 shows Kim Jong Il inspecting a power station. Washington (CNN) -- U.S. officials will soon meet unilaterally with North Korean representatives to facilitate the resumption of talks on ending North Korea's nuclear program, State Department spokesman P.J. Crowley said Tuesday. The U.S. delegation will be led by the administration's point man on North Korea, Stephen Bosworth, who will travel to the North Korean capitol of Pyongyang. In recent weeks, North Korea has sought direct talks with the United States in what American officials saw as a possible re-entry to full negotiations with the U.S. and other countries over ending Pyongyang's nuclear program. A possible Bosworth mission had been widely anticipated, but this is the first formal announcement. The so-called "six party" talks on North Korea's nuclear program had come to a standstill. But the Bosworth trip could lead to new negotiations between North Korea and the United States, South Korea, Japan, Russia and China. The development comes just before President Obama travels to Asia next week, with a stop in South Korea. "President Obama and Secretary Clinton, after careful consideration and extensive consultations among our allies and partners, ...have told North Korea we are prepared for Ambassador Bosworth and a small inter-agency team to visit Pyongyang at an appropriate time not yet determined," Crowley said at his midday briefing at the State Department. The United States is being careful to describe the Bosworth trip as only a limited diplomatic foray, and one not designed to replace the fuller negotiations. "Ambassador Bosworth's discussion in Pyongyang will take place in the context of the six party talks. From our standpoint, the purpose will be to facilitate the early resumption of the six party talks," Crowley said. "We are very realistic about our expectations," he said. "We come to this meeting prepared to engage North Korea in the context of the six party talks, but obviously the bottom line here is that North Korea has to take affirmative steps toward denuclearization. That remains our core objective."